What are we thankful for this year? For many things. We are thankful for the presence of one another. We are thankful for the fortune that those we love are healthy. We are thankful that we have been graced with the ability to make better choices than at any other point in the past, and that these choices have led to more compassionate lives with the prospect of a more healthful future. I’ve always made a bread-based stuffing for Thanksgiving in the past but for whatever reason, I just wasn’t feeling the urge to do that this year. Instead, I wanted to make something earthy and, to my mind, far more wholesome and sustaining. It also happens to be gluten-free, which gives those with gluten intolerances another option for holiday dressings. I thought the combination of wild rice and millet would make a beautiful duo when melded together with seasonal fruits and vegetables. This dish set the tone for a gorgeous holiday meal. Add the millet to a hot pot and toast for a couple of minutes. [You will hear the seeds beginning to pop when they’re ready.] Add 2 cups of vegetable stock and a pinch of salt. Bring to a boil and then drop to a simmer. Cover and cook until the millet is light and fluffy. This should take about 20 minutes. In another pot, bring 3 cups of vegetable stock to a boil and add the wild rice. Reduce heat to a simmer. Cover and cook for 35-40 minutes or until the rice is soft. Place the bite-sized pieces of beet and the quartered Brussels sprouts on a sheet pan. 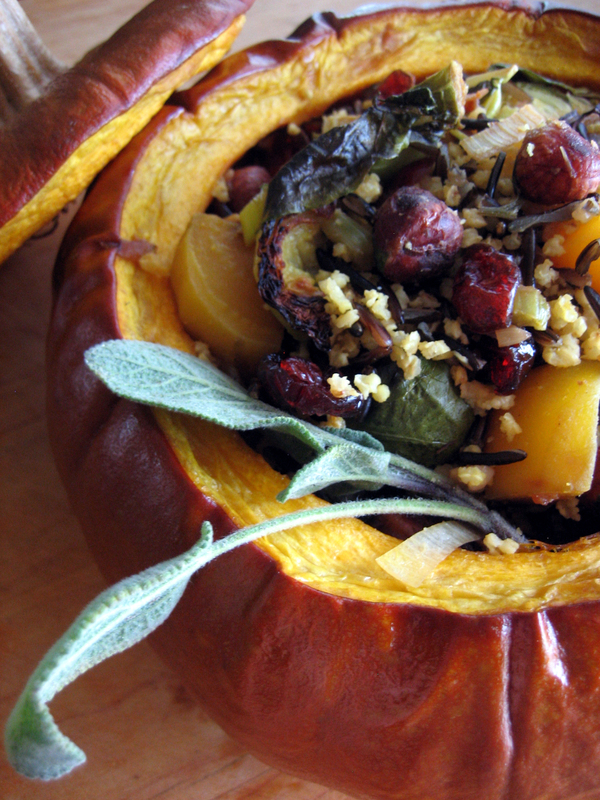 Place in the oven and roast for about 30 minutes or until the edges of the vegetables have caramelized. Add a drizzle of olive oil to a pan and add the celery, shallots, leek and garlic. Cook over medium heat until softened. Add the fresh herbs. [I like to tie mine together with kitchen twine so that removing the stems isn’t a hassle.] Add the hazelnuts and dried cranberries and mix well. Add one cup of vegetable stock and reduce heat to a low simmer. When the millet is ready, fluff with a fork and transfer to a large bowl. Drain the wild rice when ready, if necessary, and add to the bowl with the millet. Mix in the contents of the pan, removing the herb stems. Season with salt and pepper to taste. Lastly, gently fold in the roasted beets and Brussels sprouts. I served this in a roasted pumpkin. If this is how you’d like to present this dish then you will need to get a medium-sized pumpkin and cut a round out of the top. Clean out the seeds and stringy bits with a spoon. Place the hollowed out pumpkin and the top you removed on a baking sheet. Place into a 400°F oven for about an hour or until the pumpkin has softened. Remove from the oven and place upon a plate. After that it’s just a matter of filling the pumpkin with the stuffing and serving it at table. Roasted pear purée was the key to giving this loaf an amazing seasonal flavor and moist texture. The ingredient list reads like a Who’s Who of healthful botanical phytochemicals, polyphenols and antioxidants as well as omega-3s. Cut 3 pears in half and core. Place them upon a baking sheet and roast for an hour. Thirty minutes into the roasting time, add the garlic cloves [wrapped up in some aluminum foil with a small bit of olive oil]. Sauté the leek, shallot, celery, bell pepper and mushrooms in a drizzle of olive oil until softened. Add the herbs and mix well. Place the tempeh into a food processor and blend until well crumbled. Add to the sautéed vegetables, mixing thoroughly. Remove the pears and garlic from the oven and reduce the oven temperature to 350°F. Place the roasted pears and garlic into the food processor and blend until homogenized. Add to the tempeh mixture on the stove. Add the flax meal and bread crumbs and stir to combine well. Season with salt and pepper. Core the remaining pear and cut into slices. Line the bottom of a oiled loaf pan with them, overlapping each piece with the previous one. Spoon out the loaf mix atop the pear slices and fill the pan. Press down with the back of the spoon to compress the contents well. Bake for an hour. Allow to cool slightly and then gently invert onto a serving plate, pear side up. 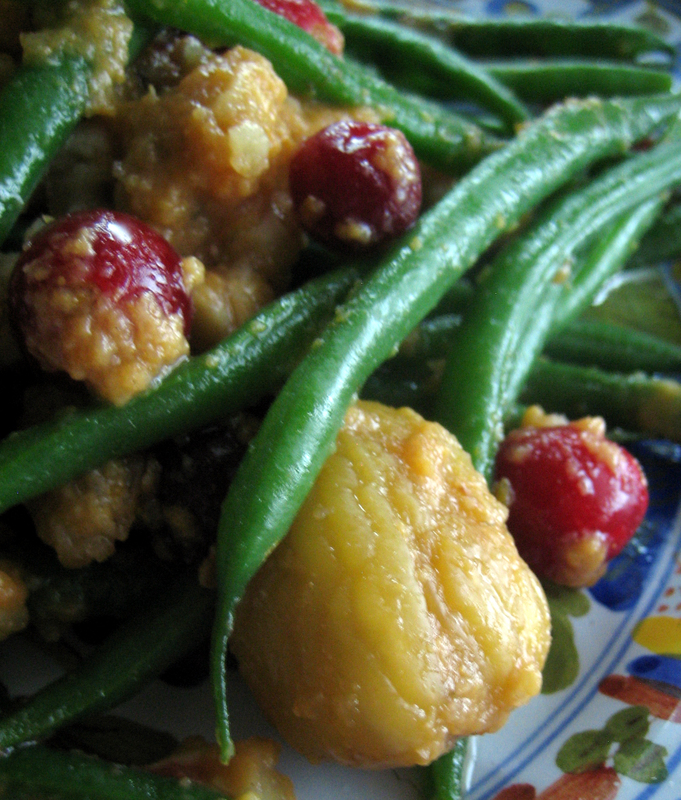 I served this over some steamed green beans with roasted chestnuts [pictured above] as well as spooning it over the tempeh, walnut and roasted pear loaf. This tart, tangy and sweet gravy tastes wonderful with savory dishes. Place the apple juice, vinegar, garlic, persimmon, orange zest and thyme into a pan and bring to a simmer. Reduce volume by half [~20 minutes]. Add reduced contents to a blender and blend until homogenous. Return gravy to the pan and add the cranberries. Bring to a low simmer and cook until the cranberries have popped [~10 minutes]. Season to taste with salt. The notion of a raw pumpkin pie has been tugging at my brain for a long time now. Thing is, I wasn’t in the mood for a high caloric raw pie crust full of nuts and dates and such things after having such a large meal, so I opted to simply make the filling. It’s all anyone ever really eats anyway, right? Seed and peel the pumpkin [I reserved and roasted the pumpkin seeds to use as a garnish]. Cut into a medium-sized dice. Set aside. Hack into the coconut [Great how-to video here], reserving the coconut water and flesh. Set aside. Add the pumpkin, dates and coconut flesh to a food processor and process until smooth. Add the coconut water to aid the blending until you get a thick but smooth consistency, remembering that you can always add more liquid but can’t remove it. Split the vanilla bean and remove the seeds with the back of a paring knife. Add to the food processor along with the other spices. Blend well. Add the almond meal, ginger, lemon zest and pinch of salt. Process until smooth. Add agave syrup to taste. Place in the refrigerator to chill. 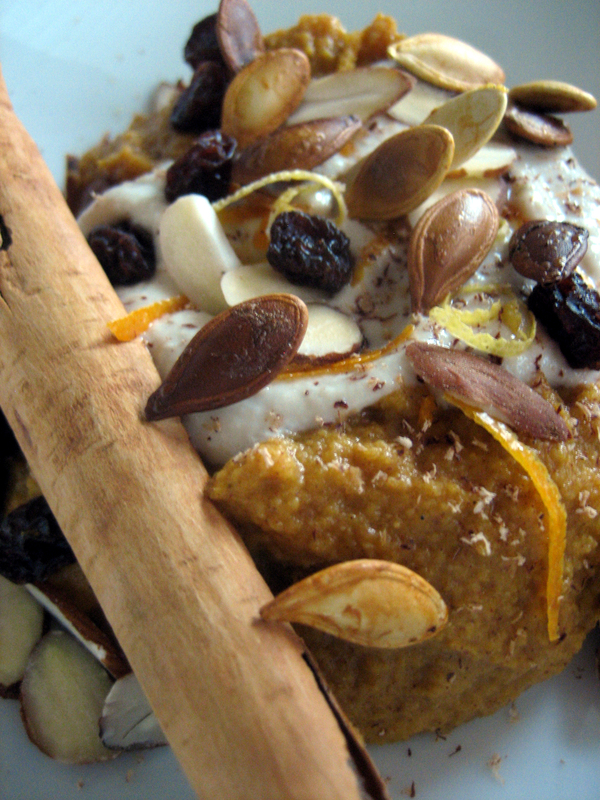 The almond meal will help to thicken the pumpkin pudding just as the coconut water will loosen its consistency. You can adjust this to your tastes as you wish. This is really nice served with a ginger cashew cream like the one I made here, and garnished with raisins, zests, nuts and seeds. Oh boy do I want all of this right now, but I just had dinner 😦 Anyway, an absolutely lovely meal guys. Wish I had been there for the preparation and the tasting. And that Pumpkin custard! If only I had some right now. What an amazing treat. In all truth and honesty, I can taste it in my mind. 🙂 This custard is definitely going to be my contribution to our Thanksgiving dinner plans. Way to go Soundly. You never cease to impress. Happy Holidays. 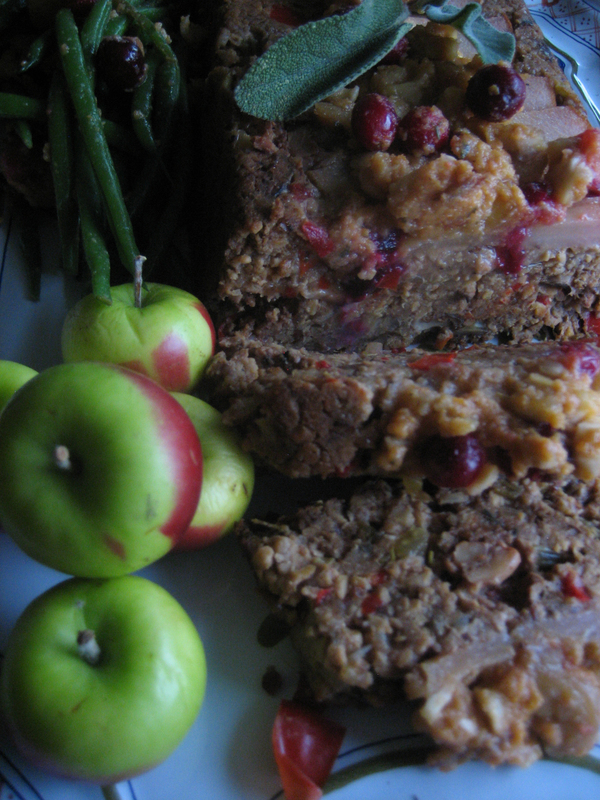 Your vegan feast looks delectable!! Thank you so much, Gauri!